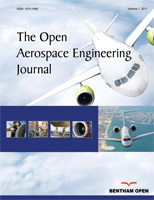 The Open Aerospace Engineering Journal is an Open Access online journal which publishes research, reviews, letter articles and guest edited single topic issues in all areas of aerospace engineering, aiming at providing the most complete and reliable source of information on current developments in the field. For all online submissions, please provide soft copies of all the materials (main text in MS Word or Tex/LaTeX), figures / illustrations in TIFF, PDF or JPEG, and chemical structures drawn in ChemDraw (CDX) / ISISDraw (TGF) as separate files, while a PDF version of the entire manuscript must also be included, embedded with all the figures / illustrations / tables / chemical structures etc. It is advisable that the document files related to a manuscript submission should always have the name of the corresponding author as part of the file name, i.e., "Cilli MS text.doc" , "Cilli MS Figure 1". Research articles should be of 4000-6000 words with 75 or more references excluding figures, structures, photographs, schemes, tables etc. This journal publishes open access reviews on recently published books (both print and electronic) relevant to the journal. Publishers and authors of books are invited to contact our book reviews editor at toaej@benthamopen.net with book review requests. All submitted books will be reviewed by an independent expert in the field. No page charges will be levied to authors for the publication of book reviews. For Research Articles the manuscript should begin with the title page and abstract followed by the main text, which must be structured into separate sections as Introduction, Material and Methods, Results, Discussion, Conclusion, Conflict of Interest, Acknowledgements and References. Greek symbols and special characters often undergo formatting changes and get corrupted or lost during preparation of a manuscript for publication. To ensure that all special characters used are embedded in the text, these special characters should be inserted as a symbol but should not be a result of any format styling (Symbol font face) otherwise they will be lost during conversion to PDF/XML2. Only ISO symbols, written in italic, should be used for the various parameters. All kinds of measurements should be reported only in International System of Units (SI). SI units should always be written in roman and separated from the numerical value by a space (whatever the language). The μ in μg or µm should be in roman. The symbol for liter is L and that for minute is min. For temperatures, please note the use of °C and °F but K. As the Ångström (1 Å = 10-10 m) is not an SI unit, it should be replaced by the nanometer (1 nm = 10-9 m) or by the picometer (1 pm = 10-12m): 1 Å = 0.1 nm = 100 pm. Multiple units should be written with negative superscripts (for example, 25 mguL-1 us-1). Particular care should be taken to distinguish between the number zero (0) and the letter O; the number one (1) and the letter l, the Roman letter v and the Greek letter nu (n). The decimal logarithm should be written "log" and the natural log "ln". The abbreviation of the exponential function is a roman e (for example, ex ) or exp (for example, exp (u2 + n)). In expressions of the type dxdt, the letter d (derivative function) is always written in roman, whereas the physical parameter (x or t) is always in italics. Numbers are written in numerals when they are followed by units, these being represented by their SI symbols (10 % but a few percent). N. Osifchin and G. Vau, “Power considerations for the modernization of telecommunications in Central and Eastern European and former Soviet Union (CCE/FSU) countries,” in Second International Telecommunication Energy Special Conference Special Conference, 1997, pp. 9-16. P. H. C. Eilers and J. J. Goeman, "Enhancing scatterplots with smoothed densities", Bioinformatics, vol. 20, no. 5, pp. 623-628, March 2004. [Online]. Available: www.oxfordjournals.org [Accessed Sept. 18, 2004]. The use of superscript in the in-text citations and reference section should be avoided. All authors must strictly follow the guidelines below for preparing illustrations for publication in The Open Aerospace Engineering Journal. If the figures are found to be sub-standard, then the manuscripts will be rejected.